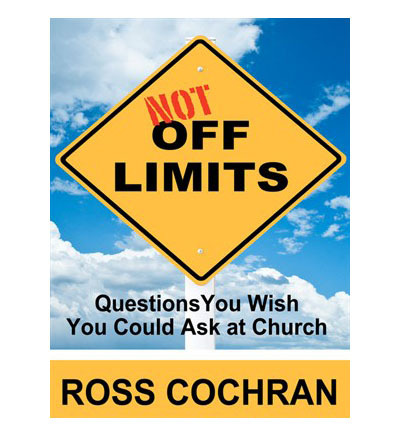 Not Off Limits, Questions You Wish You Could Ask at Church by Ross Cochran. "If there are topics that are 'off limits' at your church, you'll want to read this book. With nearly thirty years' experience teaching Bible to undergraduates and with training in writing and using case studies, Ross Cochran broaches these sensitive subjects in a way that is candid and conciliatory. Let the conversations begin (and continue) and may they be full of both grace and truth" from Monte Cox, Dean, College of Bible and Ministry, Harding University. Ross Cochran has taught at Harding University for the past 28 years. A professor in the College of Bible, he has twice received the Distinguished Teacher Award. He holds a PhD in Religious Education and Pastoral Ministry from Boston College. Cochran has served churches in Ireland, Tennessee, Massachusetts, and Arkansas. He and his wife, Nita, have three children: Chris, Allen, and Hannah.